Spooned over rice, it’s something a Chinese mum would make for her family, and each one has her own version of this classic homestyle dish. Egg & tomato is not a new concept. 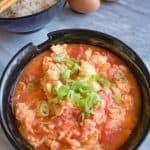 In Middle Eastern cuisine, egg & tomato is found in the classic Shakshouka, where tomatoes are simmered with cumin, fennel, and other spices before two eggs join the party. An American echo might be scrambled eggs for breakfast with ketchup on top. This stir-fry is simply eggs, tomato, sugar, and salt. Some versions include rice vinegar, sesame oil, chinese rice wine, or even ketchup itself to this dish. However, the tomato, sugar and salt alone almost mimic ketchup, and any ancillary ingredients serve to make the tomatoes more ketchup-y. Remove the core from each tomato slice into 8 wedges. Slice the top of the green onion for garnish. Take care not to overcook the eggs. Remove from the pan when they are still wet and shiny. They will be returned to the pan after the tomatoes are cooked. A non-stick pan works best, in this case, to get the eggs out of the plan as cleanly as possible. No need to clean out the pan, if you used a non-stick one. Just add the tomato wedges, sugar, and salt to a bit of oil in the still hot pan over medium heat. Cook for 3-5 minutes until the tomatoes heat through and start to break down but not completely. There should still be some semblance of tomato chunks present. Return cooked eggs to the pan. Stir to combine until you have colorful yellow chunks swimming peacefully in a calm tomato sea. 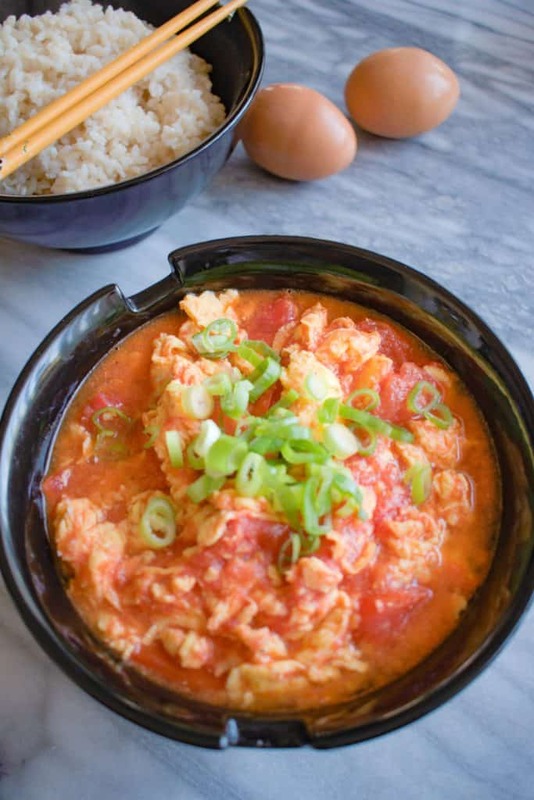 Gently spoon the hot, eggy, soupiness over steamed rice, and garnish with green onion. Let the comfort begin. When you want something simple, soupy, and homemade, this Chinese comfort food dish warms the body and soul. Ready in 15 minutes or less. Heat 1 tsp oil in a non-stick pan to medium heat. Add eggs and keep stirring just until cooked. The eggs should still be a wet and shiny. Set aside on a plate. Heat remaining 1 tsp oil in the same pan to medium high heat. Add tomato wedges, sugar, and salt. Cook for 3-5 minutes until tomatoes start breaking down, but some large pieces of tomato still remain. Add eggs back into the pan and stir to combine over medium heat. Serve with rice and top with green onion for garnish. Do you love soupy, homey comfort food? Please spread the Asian ♥ and share!